Architect John Barnes self built a new, traditional-style home using salvaged materials – and it’s worth £600,000 more than it cost to build. In 1986, he set up his own architect’s practice and established a reputation for building new homes of quality in reclaimed materials. With the business growing steadily, John hadn’t thought of building another family home until the opportunity came literally to his door. “One day I had a visit from a gentleman who was keen for me to design him a home made of ‘dirty stone’ in the back garden of his substantial property in Saddleworth,” recalls John. John was still determined to build a property in the local vernacular style that would look as if it had been standing for over 100 years. “I had always wanted to build a new house in an old style with the challenge of using traditional materials, such as reclaimed stone and timbers,” he says. The plot was a fifth of an acre of land that was formerly the paddock belonging to a mill owner’s house – so the house was named Moordale Paddock. John’s modern design follows the sloping contours of the land, resulting in an unusual multi-levelled layout with two wings extending to create an open courtyard. “Although it doesn’t look like it, the house slopes down slightly from side to side with a total of nine steps up and down across the ground floor,” he explains. “I think this is what gives it so much personality and interest. John took into account the position of each room on the plot. From the kitchen there was access into the rear garden and double doors leading into the stone-flagged glass conservatory, perfectly situated to catch the sun at the front of the house. “Although the house has period character, its modern design and layout creates a purposeful sense of flow between the rooms and wherever possible, I tried to bring the outside in,” explains John. John also has a self-contained office suite where he runs his practice, discreetly positioned at the far end of the upper floor. This floor comprises a large office and boardroom with kitchen and bathroom facilities, and can be accessed from inside the house or from a separate outdoor entrance. “One of the best things about designing your own home is being able to cater for your every need,” he says. John’s wife Helen took responsibility for the exterior, which is surrounded by a mature landscaped garden and old stone terraces on tiered levels. “We put quite a lot of thought into the garden landscaping before the build and allocated a budget of £5,000. With one eye firmly on the budget, John undertook the build with himself in the dual role of project manager and building contractor. With an extensive list of contacts in the building trade to draw on, he preferred to employ skilled individuals rather than companies. “Living locally was a great benefit because I was able to visit the site several times a day,” says John. “I would be ordering materials and I wanted to make sure they were there when they were needed and didn’t run out. 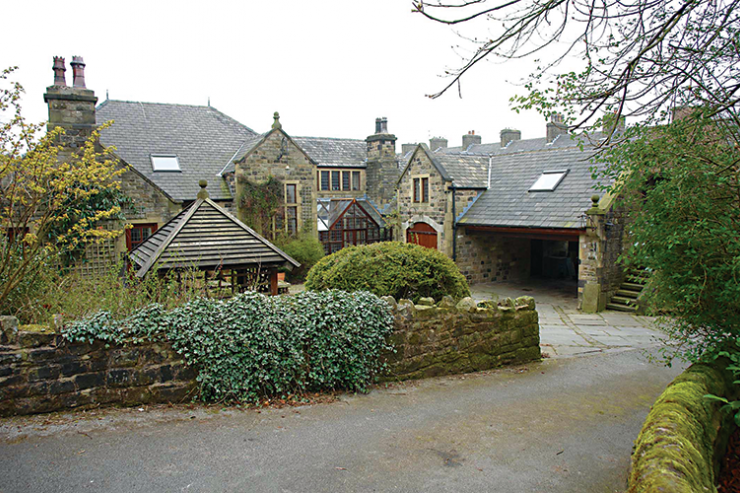 John knew that the exterior of Moordale Paddock had to look authentic so he bought 160 tons of stone from a local workhouse that was being demolished. “All the external materials of the house are reclaimed and we simply picked them up as we went along. I was doing some architectural work on a workhouse project when part of it was being knocked down. “The weathered old stone was perfect for the facade. The walls are 45cm thick with a fully insulated cavity and block on the inside. The house is extremely well insulated – and this was in the days before conserving energy in the home was such a big issue. As work on the interior of Moordale Paddock progressed, the house took on a personality of its own. With cost always a consideration, John scoured architectural antique warehouses and salvage yards for quality reclaimed materials that dictated the character of the property. “Some of the most impressive features of the house were things that I found through demolition companies, such as the Gothic stone window from a church in Rochdale that forms a floor-to-ceiling chimney breast and creates a nice focal point in the lounge. With its rich architectural detailing, Moordale Paddock is a new house with a definite sense of the past. The impressive entrance hall, with its reclaimed maple flooring and oversized pitch pine staircase, sets the tone for the whole property and shows John’s attention to detail. “My favourite aspect of the house is the satisfying appearance of the reclaimed wood used throughout – especially the staircase which makes such a grand statement in the entrance hall,” he says. John lent a hand with the joinery in the dining room, where the wood panelling also incorporates cleverly concealed storage. John and Helen finally moved into their property in April 1993. “That was the best part of the process,” says John. “I remember it well because it was the weekend after the Grand National that never was. “I had 15 people working at the house on the Saturday getting the place ready for us to move in. I said they could all take time off to watch the race and with all the false starts they spent an hour and a half waiting around until the race was eventually cancelled. “I was paying everyone by the hour, which cost me a fortune!